Having every teeny part of my work – our Agency’s work – scrutinised, is exhausting. I think I’ve spent about 15 hours with the inspector over the past 3 days. Jesus died for me. His opinion of me is never going to change. But I have called you friends, because I have revealed to you everything I heard from my Father (John 15:15). Do you not know that you are God’s temple and that God’s Spirit lives in you (1 Corinthians 6:19)? But the Helper, the Holy Spirit, whom the Father will send in my [Jesus] name, he will teach you all things and bring to your remembrance all that I have said to you. …our Lord Jesus Christ, who has blessed us with every spiritual blessing in the heavenly realms in Christ (Ephesians 1:3). I know that I am blessed…and it will be okay. We’re gonna get real tonight, people. I’ve been inspired by my wonderful friend and sister-in-Christ, Rachel. Check out what she says about friendship here. Yesterday, I met with my church Small Group; an amazing group of people – all ages, men and women, and we talked about Loneliness – the subject of our church’s most recent sermon. Listen here. We talked about the importance of real connections with people. Friendship is so important to me. I crave real connections, for people to know me and want to invest in me. At the same time, I can draw within myself if I think that people are getting too close, too quickly. Seriously though, at the end of our time together I asked my Small Group to pray for me, because for a few months now I have been struggling in a friendship that feels very uneven. I love this person, and have known them for a long time. They know me really well too. But lately, I have felt like I am the one who always makes the effort and my friend doesn’t respond or give anything back. It has been really difficult for me. At times I’ve felt like a young girl again, reminded of when friends suddenly decided they didn’t want to be my friend anymore, and I had no idea why (I still don’t, actually). I’ve wondered if I have done anything to upset this friend, or given them a reason to not want to be around me. I know I am probably not the easiest person, all of the time, but even with a lot of soul searching I couldn’t think of something that I had done. This is an issue I have struggled with ever since my very first “best friend” when I was about five; in so many close friendships I have felt like I invested more in the friendship than the other person. My own insecurities meant that I never completely trusted that the other person wanted my friendship, and I felt like I had to really work at it, rather than just accepting a good thing! I’ve really had to give this over to God; accept His love first…and trust wholly that He chose me. Knowing my identity is in Christ has really changed my viewpoint about friendships, but I still find it hard at times. In this situation, when I had no reason for why this friend seemed withdrawn from me, instead of raising it with her and discussing it like an adult, sister-to-sister, I became quite bitter in my heart about my friend. I found it incredibly difficult to talk well of her, and not complain about it at every chance I got. As I talked with my Small Group, I realised that while it upsets me that the friendship is uneven, I have no control over how my friend acts. I could speak to her about it, but I don’t believe she has done this intentionally. Her life’s priorities are different to mine and I need to accept that, lovingly. I have control over my own actions and thoughts, and I realised that they are not Godly or loving towards my friend. I got my feelings hurt, and I found it hard to forgive because my friend did not apologise for hurting me (though she shouldn’t need to) and that unforgiveness bred bitterness towards my friend. In case you weren’t aware, bitterness is a bad thing. A very bad thing. It is damaging to my heart and soul, because it roots deep down inside you and twists everything. It encourages you to see yourself as a victim, and see the world and others as the enemy. Ultimately, it hurts you. So my friends prayed for me. And I am working on confronting my bitterness and trusting God that this friendship is still worth my heart’s efforts even if there may not be an equal response. “A Paul is a mentor like friend that can teach you, encourage growth in you, and a godly person that you admire and aspire to be like. A Barnabas is a friend that is in the same place as you, so you can walk through life together, encouraging and sharpening each other in the Lord. A Timothy is a person that you pour yourself into, walk along side and can actively support and encourage in their walk. This has been a very up and down week. I don’t think I’ve liked it much! There have been some really bad points (Monday) and some really good points (Tuesday prayer time!) so essentially it’s equalled out to an ‘ok’ week, but I’m so ready for it to be over. We could not have been more annoyed really. Me especially, since I cancelled all my other work on Wednesday and Thursday as well as not going to Small Group on Thursday night to get it all done. The positive side of it all is that we do now have a handle on it, so are prepared for when the notes are required…but unfortunately it means that this whole week I have been playing catch up – against myself! I wrote my to-do list yesterday…17 items. Over the day I completed 12, but added another 9. Today I finished all but two of them, which felt very impressive even for me. I just now feel completely exhausted…the weekend cannot come soon enough! In other news, one of my foster carers might have TB and is in hospital…cue frantic call to Mum to confirm that I was vaccinated (her response: “have you got a BCG scar?” Me: “yes.” Her: “then yes, you’re vaccinated”) and panicked Googling of symptoms/contagious-ness of TB to check that the vaccine doesn’t run out or stop working…we were all on high alert!! If he has it, I may need to be tested since I work closely with the family and am considered high risk as I’m quite immunosuppresed – but that’s all just another adventure that I’ll take if it happens. Roll on Saturday…just need to cope through tomorrow first. One day, Tuesday, Wednesday…weekend yet? 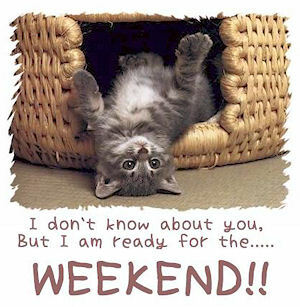 So, I feel like I’m ready for the weekend already – I had to work on Monday because we had a few emergency things in Hastings that I had to deal with, so I’ve already done three days and I feel like tomorrow should be Friday so that Friday can be Saturday so that I can sleep. I want sleep. Sleeeeeeep. Today I went to EMP, which was brilliant, and then I had a slightly later start at work this morning so I was able to go to the breakfast at Wetherspoons, but then when I got into work I was faced with a to-do list that had 16 points on it, and went almost straight into a meeting and came out of said meeting with another 5 to-do points. How many of my points did I complete today? Not great, really, but I’m not going to worry about it, I’ll just get a better start on it tomorrow. It’s not like I did nothing all day, just things kept cropping up that needed urgent attention. My to-do list is mostly typing: I’ve got about seven meeting reports (total of about 13 hours worth) to type up. I can get that done whenever, really, but I like to be up-to-date with everything so I can just pull it out when someone mentions a decision or a query. – went to the cinema twice, saw the First Grader, and Sarah’s Key. Both made me cry, I’ve read the book of Sarah’s Key and that made me cry, it’s a really harrowing book, and the film was more horrific. It was accurate to the book, apart from one bit which didn’t change the story. I’m actually glad they changed it. – made lots of plans for fun things in the next month or so! – looked into which counselling course I might like to do, but they are all super expensive and I don’t think I’d be able to fund it myself…work may support me in part but lots of the proper qualifications are full-time college courses. Grr. – went to a dinner party, for my cell leader Simon’s birthday – 12 of us around a makeshift table, having a lot of laughs and some great food. The table was literally home-made, Faith had got a big sheet of MDF of something, and some legs, and put some beakers on top of stools to make sure that the tabletop didn’t droop (really!!!) and it was a lovely evening getting to chat with everyone and catch up on everyone’s summer. – caught up with my discipler, and had a sweet evening sat talking on the sofa with her, sewing the hems on her three boys’ school trousers whilst she finished the ironing. – caught up with my best friend, who has moved back to Bedford before her wedding, I haven’t seen her in a while so it was nice to catch up on her news and wedding plans and things. … including this, and now I need to give it back so I’m gonna end here…and post an update on my first non-serving, non-Impact Sunday at church later! And I’m sure I’ve done an awful lot more than that.